At the American Association for the Advancement of Science meeting in Boston, Emily Carrington, a University of Washington professor of biology, reported that the fibrous threads she calls "nature's bungee cords" become 60 percent weaker in water that was 15 degrees F (7 C) above typical summer temperatures where the mussels were from. 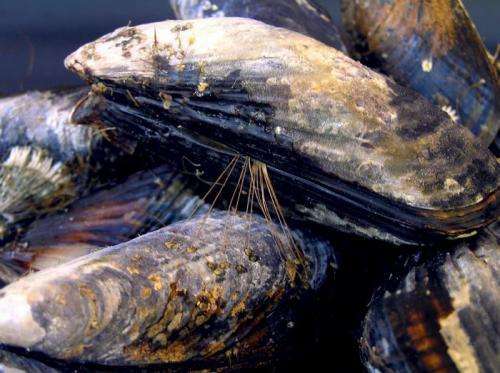 "Conditions that harm mussel populations affect commercial growers and, because mussels are at the foundation of the marine food web, also deprive predators such as crabs, lobsters and sea anemones of food," Carrington said. Such research might one day help natural resources managers in Washington, where Carrington's work was done, and elsewhere estimate future abundance correctly and recognize areas with conditions most favorable to mussel survival. It might lead commercial growers to breed resistant varieties or be on the lookout to invest in the most promising locations for the future. "Certainly spider silk is the darling of the biomaterials world because of its high strength. But the spotlight is getting brighter for mussels because they make strong, tough, durable attachments that can set underwater," Carrington said. "What biologists can contribute to the materials science arena is an appreciation of biodiversity," she said. "Mussels live in all kinds of habitats. Some species are experts at gluing onto sea grass, some to other shells, some even adhere in the harsh conditions of hydrothermal vents. They each may have different genes that code for different proteins so the adhesive will be a little different and worth exploring." Mussels form attachments to rocks, fellow mussels and other surfaces with what's called the byssus, a mass of golden-colored threads or filaments. Although each strand is only three to 10 times the width of a human hair, the threads are extraordinarily strong and stretchy, she says. That's good, given the forces at work where mussels live in the intertidal zone, the part of the shore covered by water when the tide is in and high and dry when it's out. "An inland stream with water moving at only one meter per second is very hard to stand in," she said. "Imagine something going 10 times that speed – over your whole body." Carrington's work, based at the UW's Friday Harbor Laboratories and funded by the National Science Foundation, involves field observations of natural populations that she and her team try to repeat in the laboratory. In the lab they change one factor at a time – considering such stressors as temperature and ocean acidification – to understand which of many possible environmental culprits are most important, she said. Scientists have previously found that the byssus weakens naturally in late summer and early fall. When autumn hurricanes and storms hit, both wild and commercially farmed mussels are then more prone to "fall off." In work she did on the U.S. east coast, for example, the early storms of fall wiped one third of the mussels from where they'd been attached. Even winter's nor'easters cause less fall off because the byssus by then has regained strength. "We're trying to learn what causes this seasonal weakening – is it related to warmer weather, their spawning cycle or something else," she said. "And now we want to know if increased environmental fluctuations will help put them over the edge." 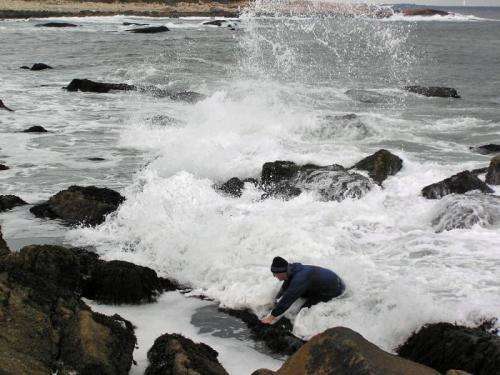 "The mussel is a keystone species in rocky intertidal areas," says David Garrison, director of the National Science Foundation's Biological Oceanography Program, which funded the research. 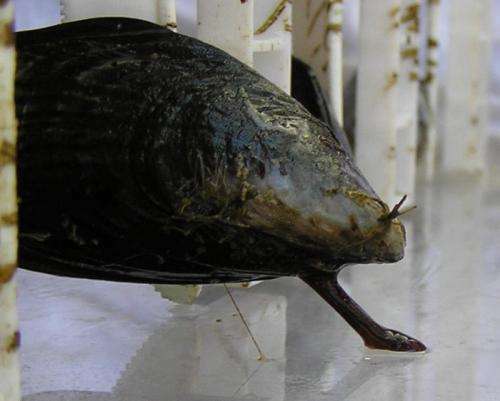 "Detachment of mussels results in lost habitat for myriad other organisms."